The holidays will be upon us before we even know it! It is never too early to begin shopping for your loved ones, co-workers, friends and even your children's school teachers! I enjoy selecting unique gifts for unique individuals, and almost everyone loves something sweet! I was excited when I discovered Bumbleberry Farms honey spreads. Bumbleberry Farms is a woman owned business that is transforming honey cultivation. Their unique approach helps promote healthy environment while also supporting community development. 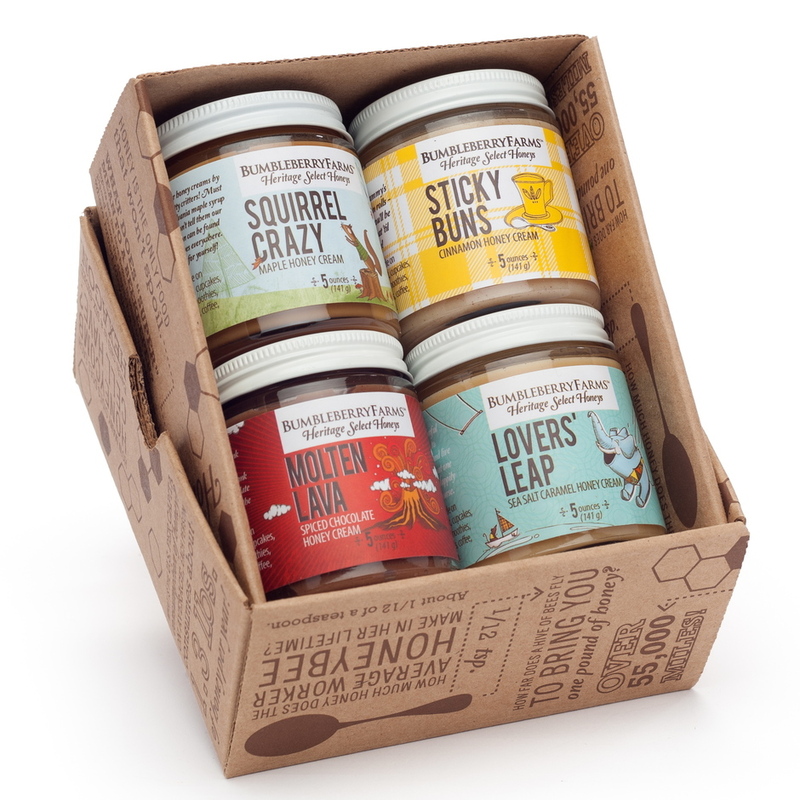 Their hand crafted, artisan honeys come in innovative flavors like their Heritage Honey Cream Spreads: Lovers Leap old world sea salt caramel, Squirrel Crazy pancakes and maple syrup, Sticky Buns cinnamon slathered in icing, and Molten Lava deep chocolate fudge spice. I was given the chance to sample two of these delicious flavors and I think I just got an idea what heaven tastes like. The Molten Lava is a chocolate lover's paradise. The Lovers Leap salted caramel is my favorite, and I may or may not have eaten the entire jar (by myself) as a dessert while watching a movie. I am not kidding, both the caramel and the chocolate contain everything desirable about a sweet treat that you could possibly crave! Add to that, Bumbleberry Farms only uses only the highest quality, clean ingredients, and a respect for how nature intended it to be. You just cannot go wrong enjoying these products yourself as well as giving them as gifts! These Bumbleberry Farms spreads are so creamy, and I can taste the delicious sweetness of honey. I love the pure cane sugar crystals that add some delightful texture. I can only imagine what these spreads would taste like as a topping on ice cream, or as a dip for fresh apple slices. Pure PERFECTION in a jar! Another plus is the adorable packaging that makes giving these tasty spreads as gifts even better. The labels are really cute! I plan to order a few of these and put them away (if I can avoid the temptation) to have on hand as gifts for teachers, bus drivers and neighbors. It would be fun to put together a gift basket with a few jars of Bumbleberry spreads along with some candy and maybe a cute little whimsical mug. The gifting possibilities are endless! How? It's easy! Just fill out the GiveawayTools form below for your chance to win! I would like to try the Lover's Leap first. They all sound so good. But I think I would go for the sticky buns first. I love creamed honey and cinnamon. The squirrel crazy sounds delicious. I would like to try the Molten Lava. The Sticky Buns sounds way too good. I'm most interested in trying Sticky Buns Cinnamon. 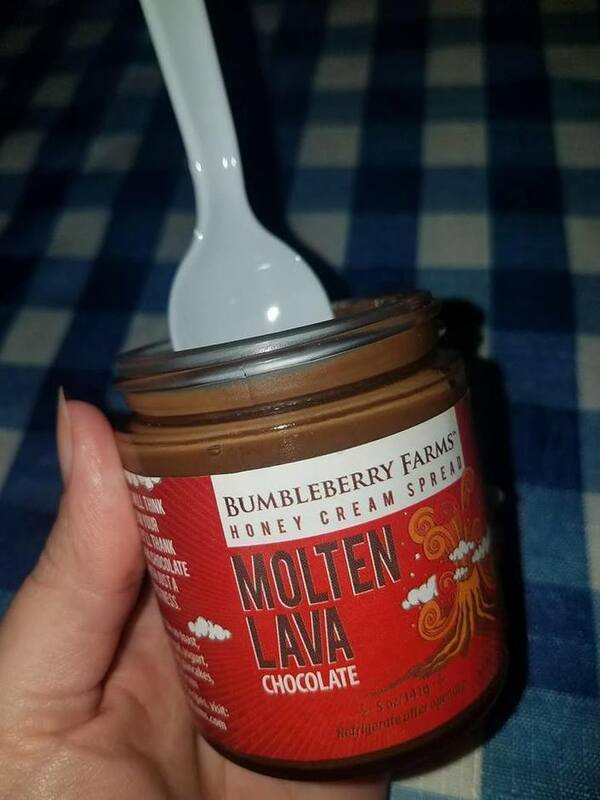 I would be excited to try the Molten Lava spread. I would love to try the Sticky Buns. Yum...sounds delicious! I would absolutely love to try Lovers' Leap. Lovers Leap old world sea salt caramel would be the one I would like to try first...but they all sound delectable! I want to try them all. :-) Thank you. Lovers Leap sounds like it would be yummy!! Sticky Buns Cinnamon sounds good. I would love to try Lover's Leap - yum! These all sound good. Especially Squirrel Crazy. I am most interested in trying the Molten Lava. I would like to try Lovers' Leap. Oh Sticky Buns sounds wonderful! Molten Lava chocolate sounds the best. They all look good. I think I would try Sticky Buns first. Sticky Bund sounds amazing! Thanks for the chance! Molten Lava sounds the best to me because I am a chocolate lover! Would love to try the sticky bun flavor, sounds so yummy! They all sound delicious but I think I'd try the sticky buns first! I most want to try their Molten Lava Chocolate! I'd like to try Lovers Leap. I would love to try Squirrel Crazy. It sounds like it would be great with pancakes. You can't go wrong with chocolate, so the molten lava variety is my top choice. I would love to try the Sticky Buns Cinnamon one first! Definitely the Molten Lava Chocolate sounds great. Ok they all sound great to me! I would like to try the Foragers’ Sweet Orange Blossom Honey!